How office24by7’s solutions helped food industry to miss not a potential order? Office24by7 is a plat-form to automate a complete communication of an Organization of any Industry. SMART IVR and SMART Operator are the Cloud based Solutions which resolves the needs of any entity. Office24by7 offers even In-Host Solutions and built and execute as per Client’s necessity. 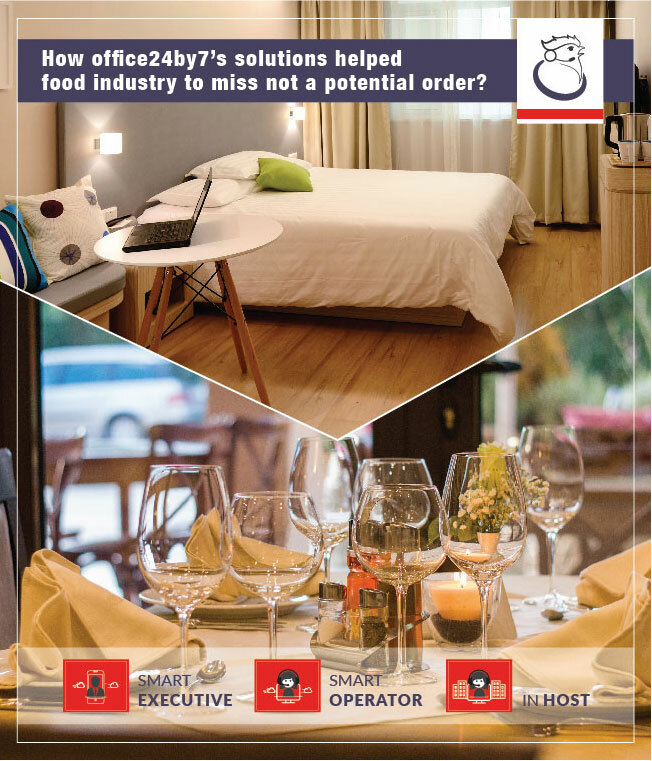 Office24by7 has instigated single stop solutions to facilitate a persistent connection between Food providers and customers. Smart IVR works as Virtual Receptionist and SMART Operator works as front desk operator. Especially, Hotel & Restaurant industry is being a 24/7/365 days responsible industry, it is essential to have high inevitability to maintain entire communication promptly. Although finding difficulty in scrawling a demanding promptness in everything from taking orders, on time delivery, conveying menu details on phone to food quality and service etc. Hence our solutions play vital role critically not to miss a single potential order for satisfying customer which is must to advance reputation. Our solution handles the areas as below. On time Delivery - Manages Delivery executives promptly to address all the orders. Even traceable of Executive’s location. A simple Virtual Number can be allotted and activated instantly which can be configured with IVR flow. To justify of various services, Call forwarding and Call Tracking easily implemented. Once the incoming call arises, it greets the caller with a Welcome message creating an awareness and brand image providing DTMF keypad to route calls to destine in right segments as implemented.